Is it possible to have a love-hate relationship with a book? A few days after finishing this book and trying to analyze my feelings about it, I can only conclude that I have very mixed feelings about it. 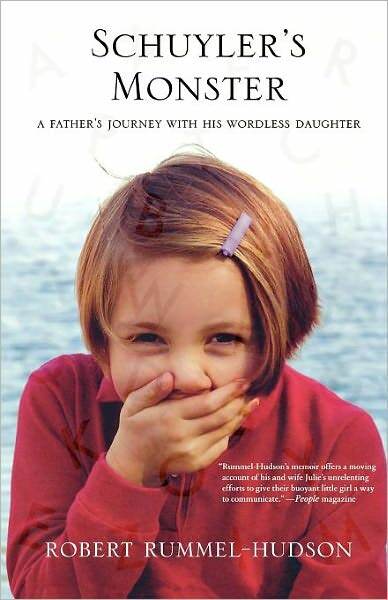 This memoir recounts, from the author’s perspective, the first seven or so years of his daughter’s life. Born with all outward appearances of “normalcy” and good health, by the time Schuyler was two, she had not developed any language skills at all, and so began her parents’ search for answers. Eventually, after a misdiagnosis of an Autism Spectrum Disorder, Schuyler is eventually correctly diagnosed with bilateral perisylvian polymicrogyria, a neurological disorder – specifically, a malformation of the structure of the brain – that commonly affects speech and often results in a host of other issues. I was hooked from the first page; I really appreciated the author’s sarcasm and wit, and I often found myself laughing, or at least chuckling, out loud. He seems like a very personable, down-to-earth guy, which makes this book very readable. While still looking for answers to their daughter’s wordlessness, and being well aware that something was going on, both the author and his wife cheat on each other. The author almost seems to excuse it or rationalize it, explaining how depressed they both were, and how they were unable to give each other the comfort they both needed during such a difficult time, and so they each sought comfort in the arms of third parties (unbeknownst to each other until later). I had a hard time with this, having confronted many a dire marital period myself, and never considering cheating. I know this is pure, unadulterated passing judgment on my part, and hey! if they’ve both made peace with it, that’s their business, right? I’m only saying it bothered me rather deeply. Yes, that’s a quote from the author in the book. He’s talking about the affair he had. It stung and caught me off guard to see the word “retarded” thrown out there by a parent of a child with special needs. To that end, it also felt to me throughout the book that the author maintained some sort of sense of . . . superiority? about his daughter and her condition. “Another little boy suffered from Down syndrome and would, without warning, run across the room and smash into walls. I watched all this during a class visit one time, and my heart broke for the parents of these kids, parents who were searching for far different answers than we were. So many things bothered me about this little passage: the blatant pity, the arrogant presumptions about the other kids and their parents. And “suffering” from Down syndrome? It’s not just that it’s not PC to say that, it’s just not true. My son has Down syndrome, and I can assure Mr. Rummel-Hudson that he’s not “suffering.” I kind of resented the feeling throughout that he held his daughter out to be better, somehow, than kids with other conditions or disabilities. What is paradoxical, however, is that throughout his memoir, he refers to Schuyler as “broken.” Always implicit in this description is that “normal” is the ideal, and anything less is defective, bad, wrong. Referring to her condition as “the monster in her head,” bringing to mind something terrible and fierce, contributes to this sense that he sees his daughter as imperfect, and he never really stops lamenting this. I kept waiting to see personal growth and evolution in his attitudes, but I never really did. Throughout the book, even after receiving his daughter’s diagnosis, he continues to throw around terms like “idiot,” “moron,” and even “epilepsy-inducing.” While I appreciate irreverence, certainly, this just seemed insensitive. Despite the revelation and this uplifting passage at the end of the book, I never got the sense that the author ever stopped feeling victimized by the whole thing. And while he described himself as agnostic, he seems to very much believe in God, but is pissed off at God under no uncertain terms. All that said, he and his wife show what it means to become strong advocates for their daughter, and I felt a growing sense of respect for this. I was very inspired by their perseverance on Schuyler’s behalf, standing up to a school district that seemed to only want to warehouse Schuyler and not actually meet her unique needs. Like I said, it’s a love-hate thing I’m feeling. I do recommend the book, however. I could have written this exact thing WORD. FOR. WORD. Thank you for putting my thoughts about this book into words! have you ever read his blog? T, I’ve only read a little of his blog – some very recent posts. He actually wrote a very good post not long ago about the r-word.